Marieke Rothschild's $250,000 gift will keep the Miriam Ellis International Playhouse operating long into the future. Marieke Rothschild (left) was a re-entry student who needed a little friendship and guidance. Miriam Ellis (right) was her kind and understanding mentor. Now, Rothschild is returning the favor by endowing the Miriam Ellis International Playhouse at UC Santa Cruz. Contributed photo. Marieke Rothschild was a transfer student, feeling a bit lost at UC Santa Cruz, hoping for a helping hand. Then she met a mentor who turned her college career around. Miriam Ellis, Rothschild’s kind, gentle, and wise French instructor, took Rothschild under her wing, helping her undertake an ambitious translation project for her senior thesis and find her way on campus. 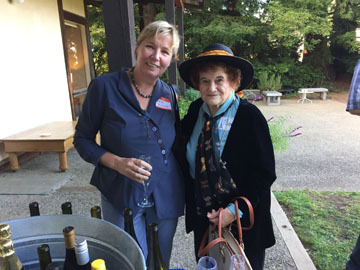 Ellis planted the seeds for the playhouse in 1972 when she started offering an annual program of theater and music in French at UC Santa Cruz. The expanded playhouse, created in 2001, often performs to capacity crowds and has run productions in Chinese, French, German, Greek, Hebrew, Italian, Japanese, Latin, Portuguese, Russian, and Spanish. Students perform in several languages on the same bill, with English supertitles making the works accessible to audiences. Rothschild’s $250,000 gift will allow the high-quality theater with a modest annual operating budget to keep going indefinitely, covering costs to put on productions, as well as staffing. “I feel so strongly about this because, in the two years I was there at UC Santa Cruz, Miriam Ellis was such a big support to me,” Rothschild said. Rothschild has many stories about Ellis helping her out in large and small ways. She was born in Holland, and had no context for certain American educational traditions, including Phi Beta Kappa, the society for academic high achievers. When she received a letter informing her that she had been selected for this coveted honor, she automatically assumed she was being courted to join a sorority. Ellis is thrilled by the recent gift, and by the chance to reconnect with Rothschild, whom she remembers as an early re-entry student, balancing the demands of family and studies. “Life can be very serendipitous,” Ellis remarked. The 17th season of the playhouse will take place from May 14-21, 2017.